If you follow my Twitter feed or have an unnatural fascination with my references to 8 lb burritos, you have probably seen references made to some of my favorite bloggers in the Cardinal National blogosphere. I frequently refer to Bob Netherton (@CardinalTales) on Twitter as the “Bob Gibson of Bloggers” due to his engaging way of telling a story and intertwining the past with the present at On the Outside Corner. He can paint the black, bring the high heat, and reach back for something extra to finish off the game. If Bob is the Gibby of Cardinal bloggers, then Daniel Shoptaw (@c70) is the content creating equivalent of Adam Wainwright. He can change speeds, hit the corners, and groove one right down Broadway when he chooses to do so. That last one looks like a meatball until it moves just enough at the end to make you whiff. That description epitomizes Daniel’s work. He could tell you that he’s throwing a cutter, and you could still miss somehow. 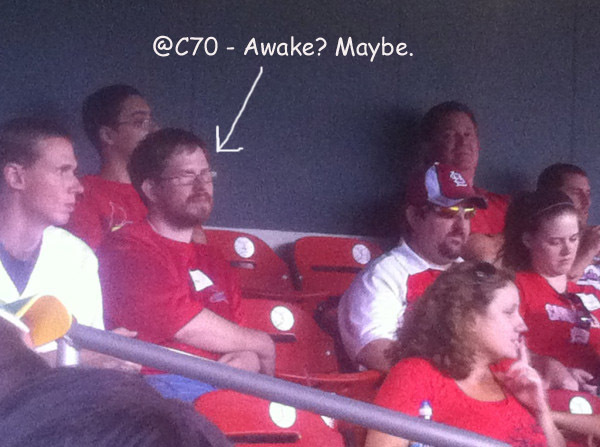 If you do not follow Daniel’s work at C70 at the Bat, then you have not seen the complete spectrum of what Cardinal Nation’s bloggers have to offer. In some ways, Daniel’s style represents a knuckle-curve in a fastball/changeup world. He might just be as unbiased and informative as anybody can be while still rooting for a particular team. His network of influence stretches well beyond Cardinal Nation and quite literally all around the US (and even Texas). Those who know him best call him the “Blogfather”, and he is a baseball fan. The Blogfather brought a significant portion of Cardinal bloggers together under 1 umbrella known as the United Cardinal Bloggers. Member blogs proudly sport the UCB logo on their respective sites, and many contributors use the #UCB hashtag on Twitter. The UCB has a presence on G+ and Facebook (feel free to give us a “Like” there). The group contains somewhere around 50 different blogs that all contribute unique perspectives and enough quality content to keep you informed between games and seasons. Behind the curtain you will find Daniel keeping in touch with Jenifer Langosch, Matthew Leach, Fox Sports Midwest, and the Cardinal organization itself. Daniel celebrated the 5th anniversary of his blog today, and he did so in typical Blogfather fashion. He recounted highs and lows with equal pointedness, and just barely mentioned the work done on both the UCB Radio Hour and his own brilliantly done podcast, Conversations with C70. He even tried to pass himself off as just a regular guy who succeeds primarily by just showing up for work. Hardly so. If the UCB hosts an event, Daniel spends hours upon end pulling strings to make it happen. When UCB Weekend took place in 2011, Daniel was the one who popped the cork on the news that we would have a Q&A with GM John Mozeliak. The UCB members participate in monthly projects throughout the year that are almost all the brainchild of the Blogfather himself. He spends countless hours putting together blog links, maintaining membership rolls, and keeping the rest of us in our respective basements doing our parts. His podcast stands alone for the conversational style and single thread approach. He can go an entire hour of solo radio hosting without using “uh” and “um” as though he is getting paid by the dozen for using them. The man looks just as comfortable talking to Jim Hayes as he does talking to his kids. It’s not like he was simply satisfied to stop with uniting a good portion of Cardinal Nation’s bloggers, either. The Baseball Bloggers Alliance (@baseballblogs on Twitter) was spawned by the Blogfather as well. The BBA (hashtag #BBBA) counts among its members hundreds of blogs covering all 30 MLB teams. Combined with the work Daniel does on behalf of the UCB, the BBA makes blogging and networking nearly another full time job for an already busy husband and father. I have the wonderfully good fortune to call Daniel a friend, and I was completely disappointed by his 5th anniversary post. Too humble. Too gracious. Too much credit given to others based on the work he did. Daniel is a family man first, baseball fan second, and Cardinal fan 3rd. Somewhere in the midst of all that he’s a professional workhorse, amateur hitting coach, and reigning wiffle ball champ of the Shoptaw household. Do not be fooled by his attempt to divert attention from himself. In the baseball blogosphere, he stands alone as a networker, information gatherer, and a fan of people as well as the game. I intend to toss back a cold beverage in his honor today. He’s the standard, the trailblazer, and the mastermind at the same time. It would only be appropriate if we could frame him and hang him on the wall. It’s an honor and a privilege….and a kick in the pants to work with you, Daniel. The inspiration for the title came from the song “Something So Strong” by Crowded House. Apropos, yes? Seriously, overwhelmingly flattered by all of this and I appreciate all you, Nick, and Josh do to make me look good. Thanks so much! I occasionally use my powers for good. Congratulations and all that, though.